A magnificent 14-storey building with a striking futuristic and bold architecture. The interiors have been made in dark earth colours that contrast nicely with the outside hot climate for a feeling of coolness and comfort. 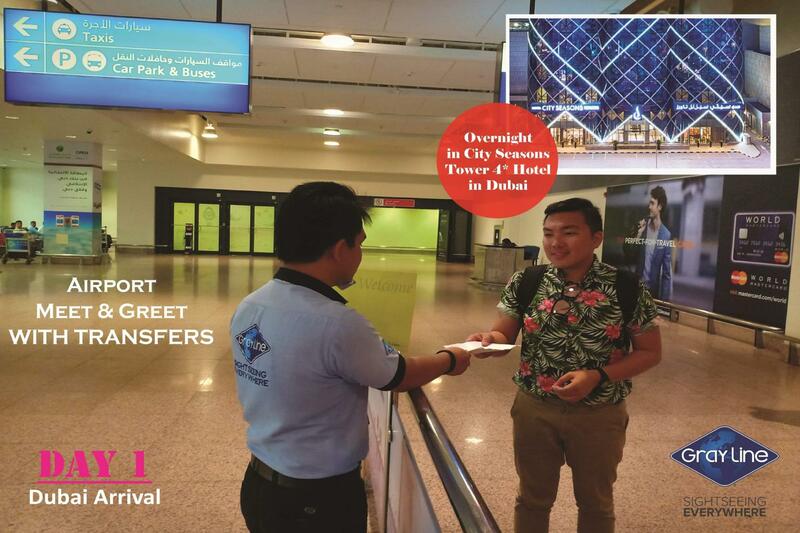 Meet & Greet at the airport by Gray Line staff .Arrival transfer by private vehicle – Overnight in DUBAI. Breakfast. 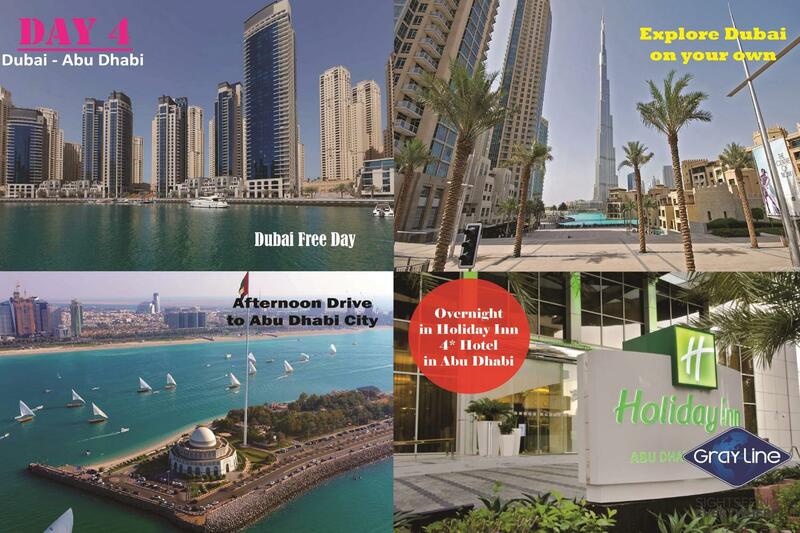 This morning we will start with a full DUBAI tour . 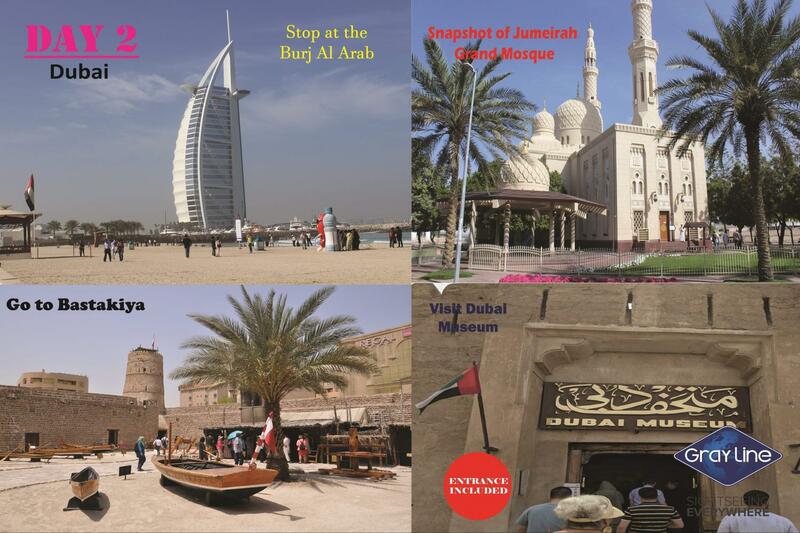 We will visit the Jumairah area , the Burj Al Arab , stop at an art center, the new Canal , stop at the Grand Mosque of Jumeirah, Bastakyia, we will visit the Dubai Museum (visit included ),cross the creek by "Abras" shop in the spice and gold souks. 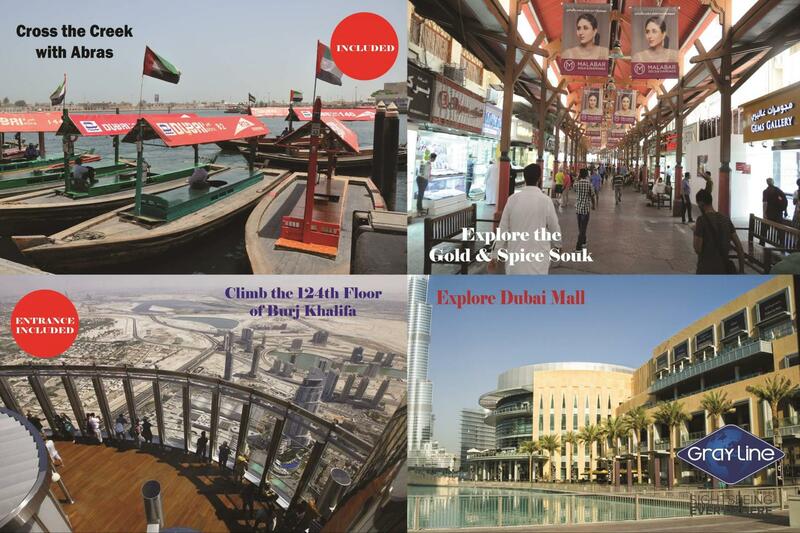 Pass DUBAI ruler palace and stop at Burj Khalifa and Dubai mall .We will climb the BURJ Khalifa to top 124 . Lunch is free at Dubai mall. 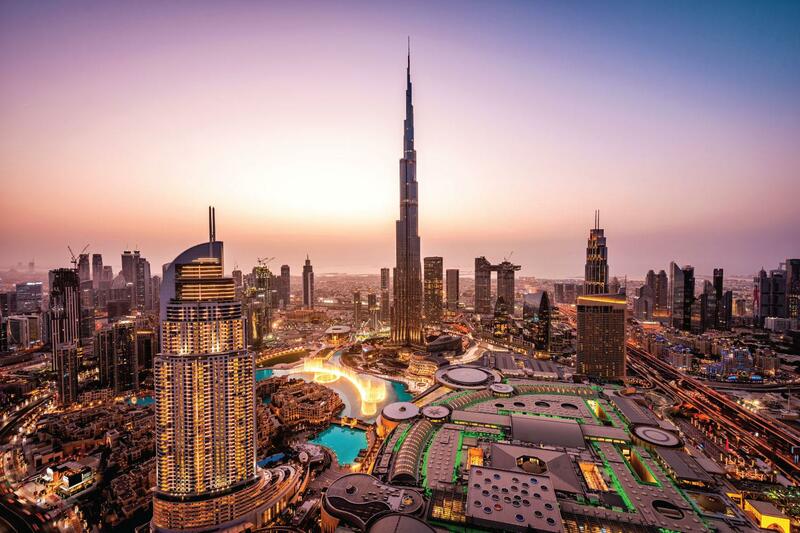 In the afternoon , we will go to Palm Jumeirah, pass CITY WALK , drive on Sheikh ZAYED road , see the Atlantis hotel , the Dubai marina, Jumeirah lake towers, to end at Mall of the Emirates, with its artificial ski resort. you go back on your own to the hotel. In the evening you will enjoy a Dhow cruise, Dubai being surrounded by water, this cruise will sail on the Creek side of old Dubai . Will offer a dinner cruise on a wonderful wooden dhow ─ built in the time-honored manner, channeling the region's historical heritage and traditions, yet with the utmost comfort that you can expect in a present day ship. Spend a romantic evening between the glistening stars as you watch the waves dance in the night while you cruise along the moonlight creek. Enjoy a sumptuous buffet dinner served with a taste of local delicacies as you sail through the deep blue Creek. Overnight in DUBAI. Breakfast, Sharjah, the Pearl of the Gulf is a must to discover and complete a visit to DUBAI . 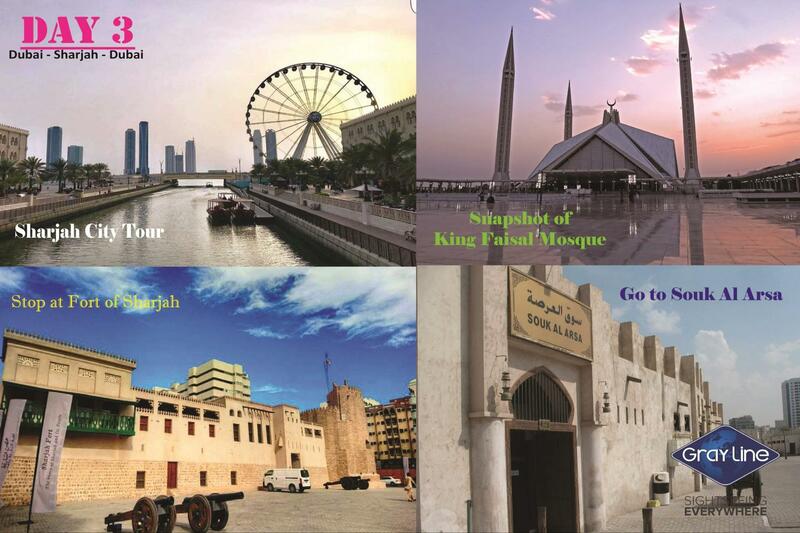 Visit King Faisal Mosque, experience Emirati culture, visit the Fort of Sharjah, learn about the customs and traditions that are deeply rooted in the Emirati culture. Continue to the Heritage Museum, and the enchanting Souk Al Arsa and Souk al Markazi, which is a veritable treasure trove of carpets, jewelery, and intricate handicrafts. The tour will end up in the Dubai Mall. Lunch is Free. Afternoon you will enjoy a Desert safari, a trip to DUBAI without a desert experience is not complete .Traveling across the deserts of Dubai in a 4x4 Gray line vehicle. 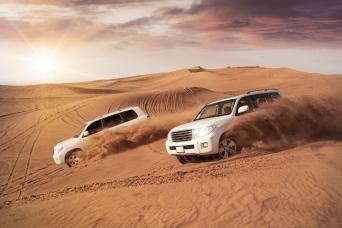 You will enjoy several photo stops during an exhilarating dune drive over the golden desert sands. The drive will then continues across the desert, witness a beautiful Arabian sunset, one of the highlights of a trip to the Arabian deserts. 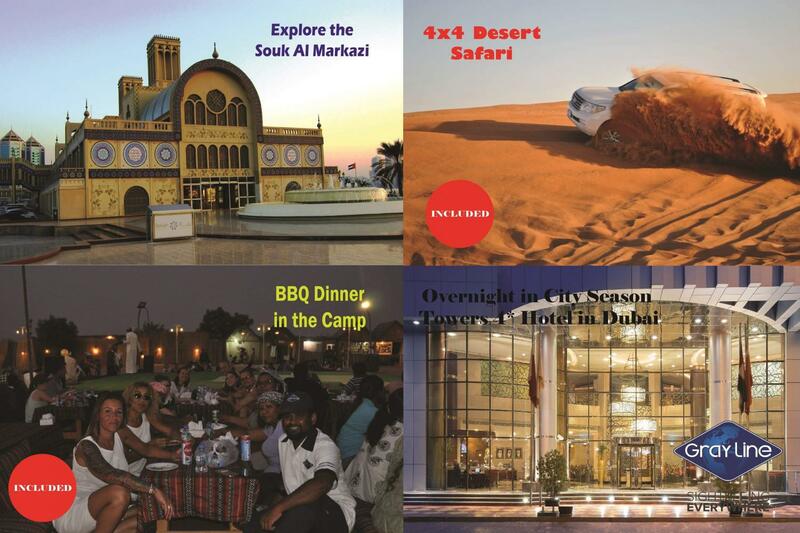 On the menu you will have access to dune bashing, a Henna experience, sand boarding, meeting and bonding with camels, and in the evening, enjoying a delicious BBQ dinner with entertainment. Whether you select the standard or the superior version, both experiences are amazing! Overnight in DUBAI. Breakfast. Morning departure to on your own or book some optional tours. Early afternoon, we will head to Abu Dhabi, lunch and dinner are free. Overnight in ABU DHABI. Breakfast, we start our day with the tour of Abu Dhabi. Discover the Louvre Museum, the latest addition to ABU DHABI growing cultural collection, but before we will enjoy Gray line's Abu Dhabi city day tour. 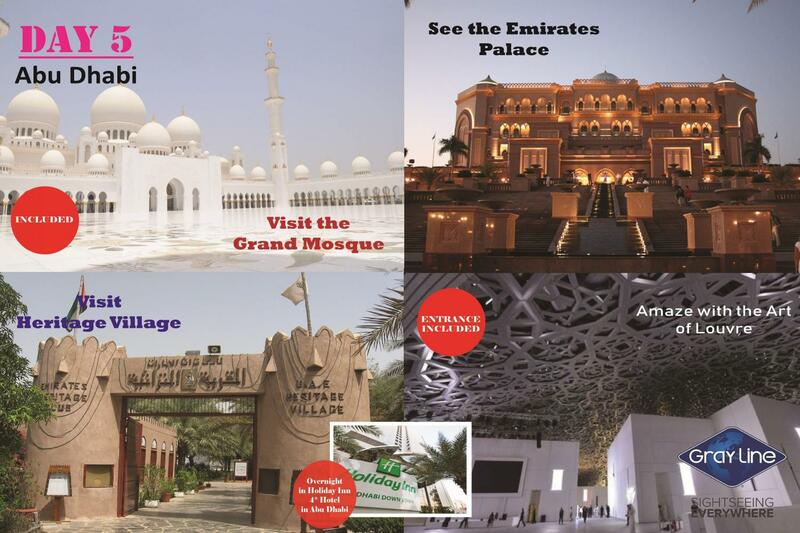 Our first stop will be at the Sheikh Zayed Grand mosque. The exquisite white structure is completely clad in marble, featuring intricate Islamic art and carvings, as well as extensive landscaping. 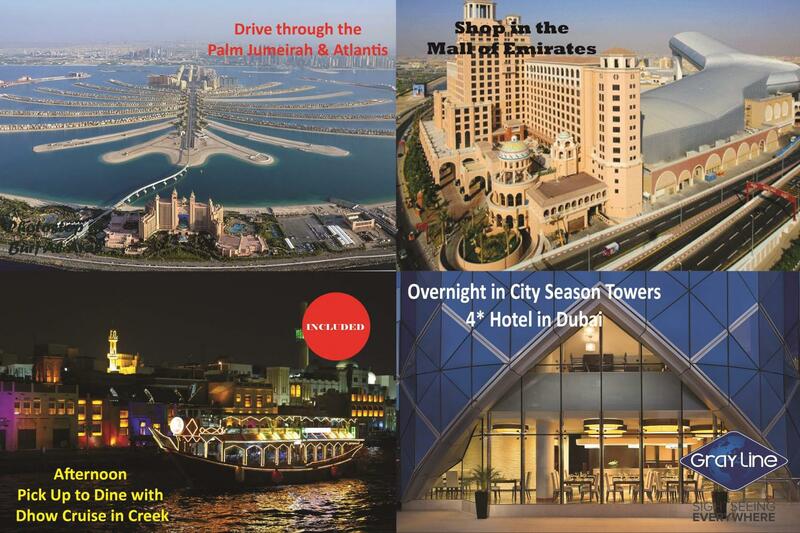 We will continue our tour towards the YAS island and its RED FERRARI, we will pass by YAS Water world & the YAS MALL. We will pass by the famous giant Saadiyat Island project where the LOUVRE (that you will visit) and GUGGENHEIM museums are being built to complete the image of ABU DHABI as a cultural Arab capital before entering the Fruit and dates market in Abu Dhabi harbor. We will drive then along the spectacular Corniche, pass white mosques, glass-clad offices, the Emirates Palace, the palace of the Emir and elegant high-rise apartments and will stop at the Heritage Village, which houses a small museum and depicts the traditional daily activities of the Arab community prior to the discovery of oil. Lunch is free. After the tour our driver will drop you to enjoy the marvelous Louvre museum for 2 hours visit! After the visit, you go back on your own to the hotel. Dinner is free. Overnight in ABU DHABI. Breakfast .This morning you will be able to enjoy your hotel or other activities. 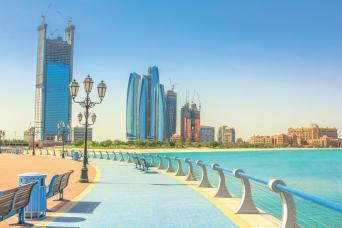 Depending on your time of flight transfer to ABU DHABI airport for departure.